Welcome to FICOBank’s exciting savers club for teens who are 13 to 19 years of age! 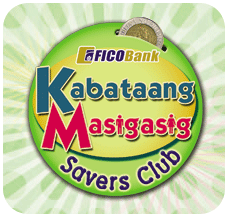 At Kabataang Masigasig Savers Club (KMSC), you will learn the importance as well as the benefits of saving. If you want a bright future, we believe that you should start preparing for it now. That’s why FICOBank is here to take you to your dreams through sound financial management. KMSC aims to teach the importance and benefits of saving for a bright future. It is designed to motivate young people like you to save and deposit part of your allowances and/or earnings, and continue such saving efforts not only up to college but into the workplace. KMSC is a good training ground for you to learn how to manage your own financial resources. Just visit the nearest FICOBank branch or extension office in your area, open a Kabataang Masigasig Savings Account (KMSA) with minimum initial deposit of Php100.00, and complete the KMSC application form. Voila! You’re now a member of a prestigious savers club that will take you to your bright future. Kabataang Masigasig Savings Account is a special type of deposit product for teens. Transactions are recorded in a passbook. Upon opening of new account, a depositor will be given a KMSA especially-designed passbook. Deposits are insured with Philippine Deposit Insurance Corporation (PDIC) up to Php500,000.00 per depositor. They will be motivated to save part of their allowances and/or earnings and learn the value and importance, as well as the benefits, of saving. They will also learn first-hand how to manage their own financial resources. KMSC is a great tool for them to instill responsible financial habits to their teenaged children. So, sign up now and experience the excitement of preparing for your future! With KMSC, the future looks bright—and even brighter with FICOBank.